Card Text Play: Stun a creature. Action: Return Lady Maxena to its owner’s hand. When I play Lady Maxena, can I target a creature that is already stunned? If I play Lady Maxena and there are no enemy creatures in play, do I have to stun a friendly creature? Yes. This effect is not optional, so you must always choose a creature to stun. 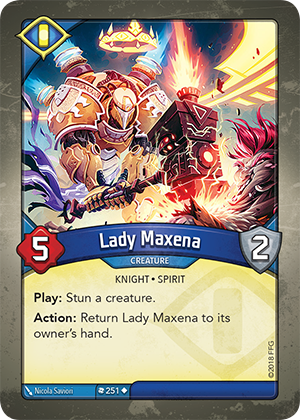 If Lady Maxena is the only creature in play, it stuns itself.